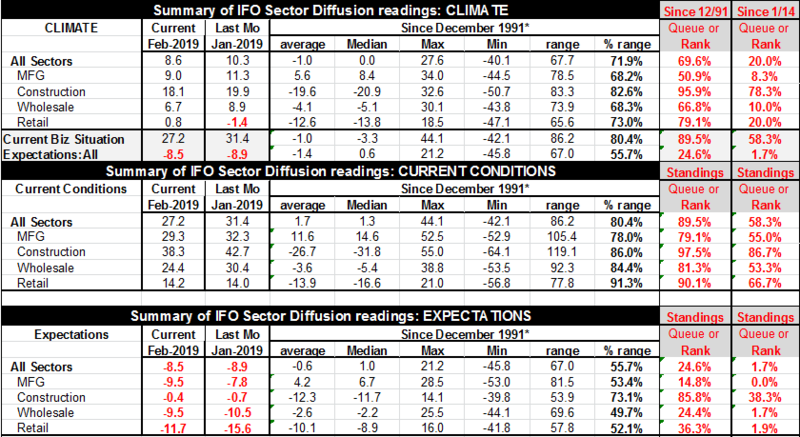 We present the diffusion readings to summarize the German ifo index. The table also looks at two separate rankings of the ifo results. One ranks the index (diffusion reading) since 2014, the second ranks the standing over a longer period since 1991. The ranking over the last five years shows much weaker standings that the rankings since 1991, an admission that over the last five years or so the German readings have been exceptionally strong. Neither set of readings is either correct or wrong, each simply provides different relative metric for assessing current performance. Nonetheless all climate metrics fell this month. In addition the current situation assessment fell by four points, while the expectations reading, which is negative, improved by several ticks. The current situation still has an 89.5 percentile standing on its long queue or rank standing compared to a 58 percentile standing when ranked on values over just the last five years. The difference in the rankings underscores how well the Germany economy is still doing in a broad historic context while at the same time acknowledging its significant slowing relative to recent performance. The climate readings show the same sort of split between long-dated vs recent assessments but with the "twist" that both show clear weakness. Over the long-dated period expectations are at the border of their bottom 25 pert of values. While over the past five years the expectations readings are even lower in the bottom 1.7 percentile - extreme weakness. Sector climate readings line up in the "same order" whether ranked historically or more recently with Manufacturing as the weak sector and construction as the relative strongest sector. The current and expectations sector readings also carry the same relative rankings as the climate rankings. Manufacturing is the weakest and construction is strongest on standing under both metrics (either current and expectations rankings). Expectations for manufacturing are the weakest they have been in the last five years and while they are better-standing on a ranking since 1991, that standing is still lower only 14.8% of the time. The German economy gives a glimpse of its performance with the Q4 GDP release that shows growth slipped to Zero after contracting in Q3. You do not need detailed industrial surveys and rankings to know that is a weak result. It also skates close to the edge of the rule-of-thumb designation that two consecutive quarters of decline in GDP make that period a recession. In addition in EMU the inflation numbers have finalized. Inflation eased for a third straight month in January to its slowest pace in nine months. Slower increases in energy prices were a major contributing factor. Core inflation logged a 1.1% annual rate. The consumer price index rose 1.4 percent year-on-year in January. Inflation is moderate and well below target. GDP growth has slowed and is near the point of contraction in Germany - Europe's "strong-man" economy. Meanwhile, the central bank has been reducing its stimulus...what is wrong with this picture? Anything? The Post War period in the United States progressed from prices stability to creeping to surging to out of control inflation. The European experience was quite different with many separate if not independent central banks. Germany came out of WWII with a the experience of hyper-inflation that has made it hyper-sensitive to any inflation pick-up. The Bundesbank's efforts to keep the inflation toothpaste in the tube helped to provide Germany with a stable environment and the strong economy of Europe developed, The lesson that Europe thinks that learned from this was one that low inflation and price stability is a winning formula. The countries of Southern Europe, that fostered more inflation and had perpetually weaker currencies, did not fare as well as Germany. Once they locked in the same Economic Union with Germany, Southern Europe has found it hard to follow the rules of membership and prosper. But Germany prospered because of more than just stable prices. And it may be that central bankers are just thinking that low inflation is more of a magic elixir than it really is. It may be a necessary condition but it is not sufficient. And no one anywhere has demonstrated the magic level inflation must be kept at to produce pro-growth results. But central banks are nonetheless settled on 2%...at least for now. With slower growth and international trade practices that had become codified even if they were not fair in the Post War system, a lot of past practice is being re-examined. Europeans do not like it. The process of re-examination is proving painful and straining to many traditional Post War alliances at a time when many other aspects of the Post War world are engaged in significant change as well. The future is in flux.